Shree Ambica Tools is a sole proprietorship firm, came into existence in 1993 as a manufacturer and supplier of an extensive range of Jewelry Making Machines, Bangle Making Machines, Tube Forming Machines and others. 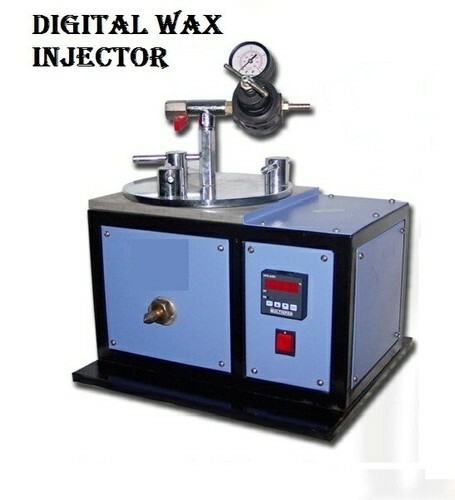 We also got specialization in trading and supplying a sturdily constructed range of Jewelry Making Instruments, Casting Machines and Vacuum Wax Injectors. Some of our range encompasses Bangle Expanding Machines, Bangle Turning Machines, Jewelry Threading Machines, Gold Melting Machines, Hollow Tube Forming Machines, Tube Forming Machines, Vacuum Pressure Casting Machines, 3 in 1 Casting Machines, Sprue Grinding Machines and many others. Products we manufacture are assembled using high grade components, sourced from the authorized vendors of industry. We use advanced production methods and technology, which keep us in line with the growing industrial tendency. Industrial recommended quality control measures and guiding principles are adopted to make sure that the products we offer are in compliance to that only. As a result, our products are acknowledged for their excellence and widely acknowledged among huge clientele. Executing the whole business operations under skillful guiding principles of our organization’s admirable proprietor, Mr. Harsheet Lalit Pandya, we have placed an enviable position in the industry. It is just because of his endless support, excellence professional approach and years of experience in concerned field that we are capably meeting the specific demands of our clients and have garnered their huge support. Our company has developed sound infrastructural set-up, spread over a huge landmass and fitted with latest amenities. Here, we have installed state-of-the-art machinery, which is upgrade as per the advancement of industry. This further helps us in improving our production capacity as well as meeting the upcoming requirements of clients in a better way. Our infrastructure consists of departments such as production, quality control, sales and marketing, administrative, research and development, logistics, warehousing and packaging, administrative and many others. Owing to the well-segregation of entire set-up, we are able to streamline our all business activities.